What better way to end the summer than with s'mores and a campfire? On National S'mores Day, August 10th, take the time to prepare for your weekend getaway. This sticky bread is a sweet way to end a day of exploration and hiking. It only calls for one refrigerated ingredient and the rest can be premade at home. It tastes even better over an open flame! Pour the cinnamon sugar into a plastic bag, add in a few biscuits and shake to coat. Repeat with all the biscuits. Melt butter and stir in brown sugar. Pour mixture over biscuits. Before putting on your lid, place another layer of foil across the top of your dutch oven to catch any stray ashes. Bake over moderately heated coals for five to ten minutes or until center is cooked through. 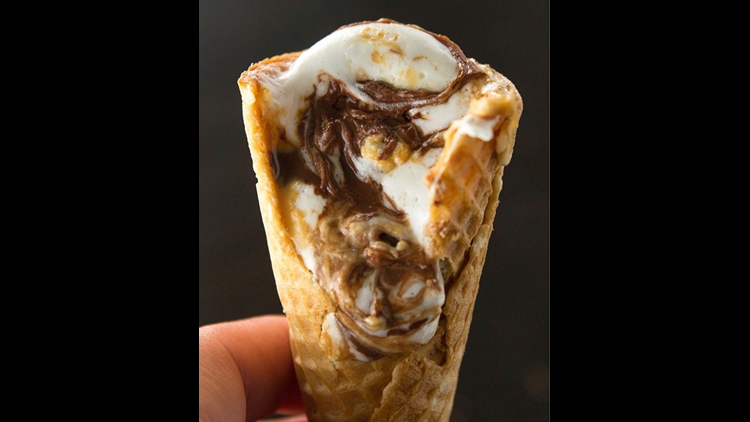 Customize your usual s'mores by using a waffle cone instead of a cup. 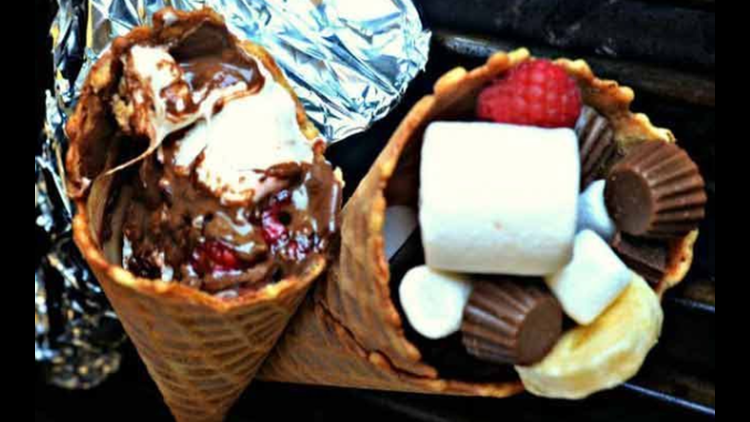 Fill each cone with marshmallows, chocolate chips, and other toppings of your choice. Heat over fire (away from direct flames) for seven to ten minutes. Voila! Using the frito chips that are usually left at the bottom of the snack packs, put together a nacho meal you can eat on the go. Brown beef or turkey in a pan over campfire and drain fat. Add the onion to the meat and sautee a couple of minutes until soft. Add the taco seasoning along with half a cup of water and simmer. Spoon meat and bean mix into the chips bag, and add condiments! This two-ingredient meal is turns making hotdogs into a culinary affair for everyone. This easy recipe is the perfect balance of sweet and saucy. Place a skewer about 3/4 the way into each hotdog. Open your crescent rolls and wrap one long pre-cut triangle around each hot dog. Loosely wrap your crescent wrapped hot dogs in aluminum foil. Cook for 15-20 minutes and you're done! Instead of s'mores, try this tasty dessert. 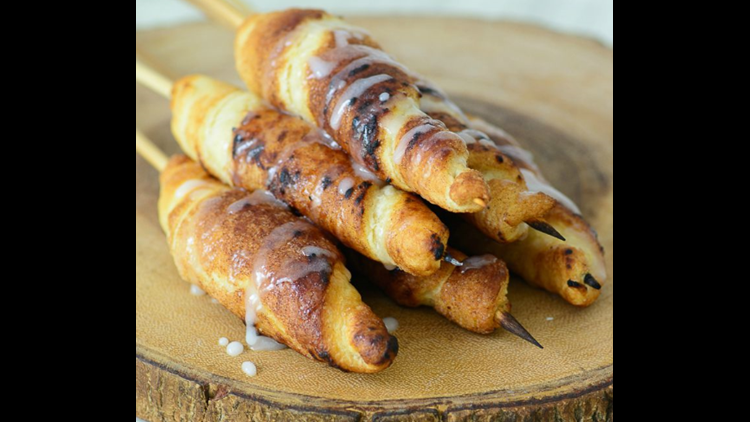 Not only is it delicious, but you'll also feel like a total pro making your own sugar glaze over an open campfire. 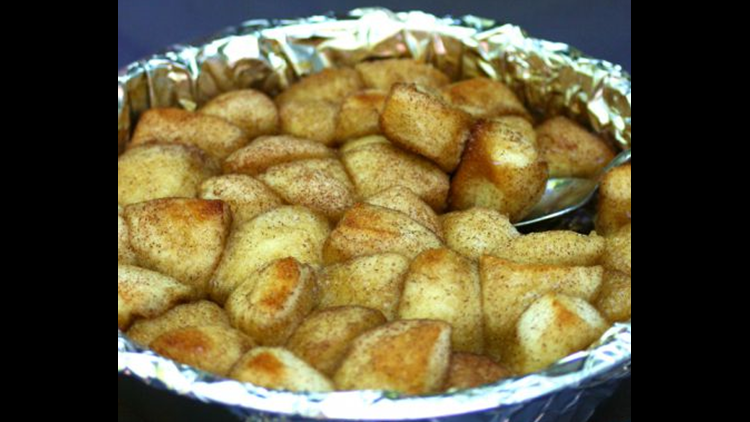 Optional - Mix 1/4 cup powdered sugar and 2-3 tbsp water together to make a glaze and drizzle over roll-up.